"give me consciousness or give me death"
is a nation, tworn in two, swearing by countries, creeds, races and culture. is a nation of dreamers, sleepwalking thru their life's present. is a nation who basis their relationship with one another on status. is a nation who identifies with their material possessions. There are 32 friends in My Mosh Pit. Any electronic/rock/rap bands/djs/mcs want to play with us?? 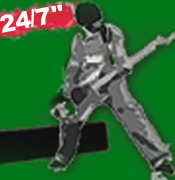 Looking to join the band with turntables, keyboards, guitar or bass? ?